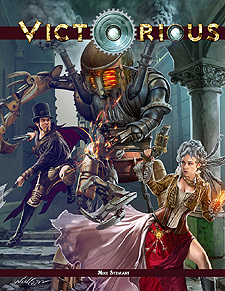 Victorious, the newest core game powered by Troll Lord Games' celebrated Siege engine, allows you to create a wild assortment of heroes, from the wickedly smart to the inhumanly powerful. Victorious can be scaled to meet adventure with investigators of crime, defenders of society against evil monsters, and even mad scientists foiled by masked superheroes. Character classes that run the gamut of Fantastic Victoriana, from Contraptionists to Magicians, to Investigators and Mesmerists and more! A system to create your own unique character. Details of life in the Victorian era, with emphasis on London and New York City. Combat in all its forms, and how the Supernatural can impact both melee and missile combat. Carriage chase rules are provided as well as combat from trains to ships to the air. An individualized magic system as well as rules to use the Castles & Crusades magic spells if desire. Conversions of characters from C&C and Victorious to each other's rules are a snap and guidelines are given for such. An introduction adventure where the death of Dr. Henry Jekyll is investigated and is not what it seems.